FxGS has the following items for sale. Click on the link to scroll to that item. 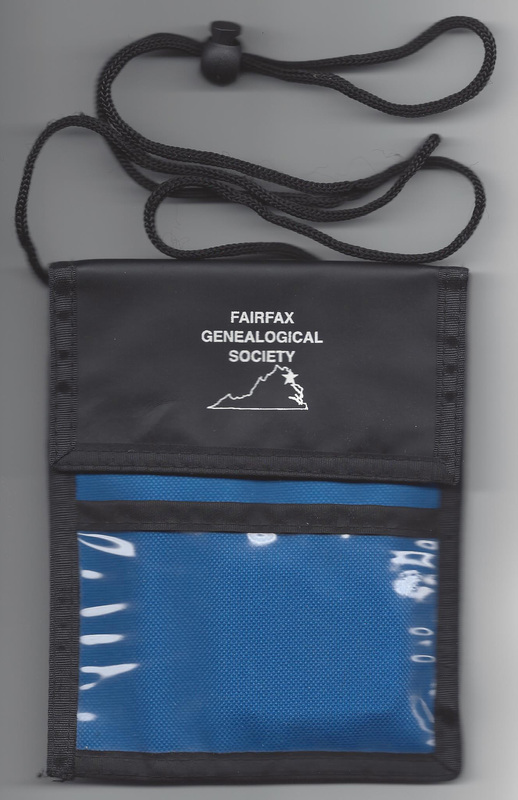 We have badge holders for sale with the Fairfax Genealogical Society name and our logo (State of Virginia with a star for Fairfax County). They are in royal blue with black trim and top cover with a velcro closure, and the name and logo in white on the black cover. They measure 5-1/2 inches wide by 6-1/2 inches high. 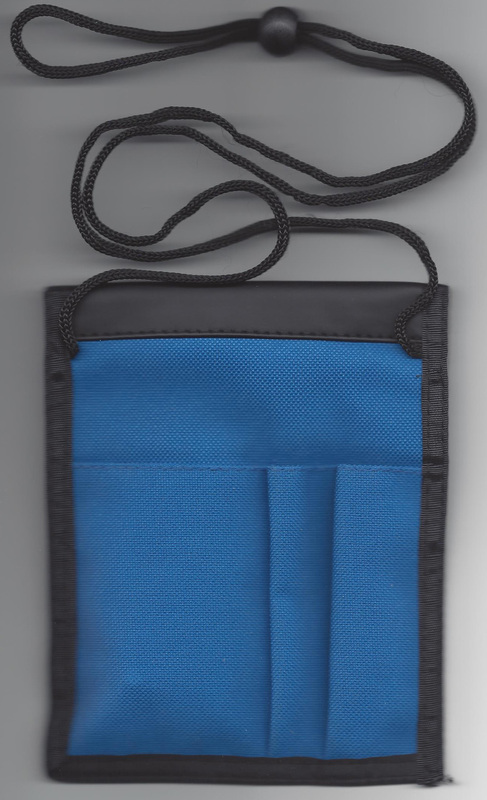 There is a clear plastic pocket in front for a name badge, a covered pocket that is the full size of the holder to keep money or other items with a velcro closure, and 2 holders on the back for pens and one for other larger items. It comeswith an adjustable cord so it can be worn around the neck. We also have lapel pins for sale that include our Society name and the official logo of a lion and eagle around a tree. They are in metal that is ceramic coated in color, and have a diameter of 7/8 inch. If you wish to purchase one, send an e-mail to Nell Hurley at corrsecretary@fxgs.org. You can pay by cash or check, and arrange for pickup at a mutually agreeable time. If you want to pick one up now, call Nell and arrange a time for pick-up and payment at her home in Fairfax. Please call her at (703) 250-0065. Heidi will contact you after you make your orders to verify your information and color and size preferences. If you need a size other then what is offered, she will be able to offer suggestions for that also. She also has a variety of other items available through her website. The Flip Pal lightweight scanners are just 4x6 inches, and convenient to keep on your desk, put in a drawer, or slip into a briefcase or bag. They run on 4 AA batteries, and can scan files, documents, or periodicals of any size. You can scan small pictures or other items (up to 4X6 inches) directly by putting them on the screen and closing the cover, or you can scan larger items in sections by removing the cover and flipping the screen so it is on top of the item (see pictures at right and below). They work by scanning sections of the document and "stitching" the sections together seamlessly on your PC or laptop with built-in software on the SD memory card that comes with the scanner. No expertise is required by the operator: you get a single file which you can download to your hard drive like a digital photo. A built in LCD screen shows you what you have scanned. These scanners are handy for genealogists, researchers and scrapbookers. 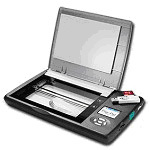 We have several members who have purchased Flip Pal Mobile Scanners, and they love them. As a fundraising campaign for our Society, we have ordered several Flip-Pals and several accessories. Each sale benefits your Society. Our prices are the same as those of the manufacturer. However, direct purchase from them would involve an additional shipping fee. Our price includes both shipping and sales tax. Purchasing from the Society benefits its members. 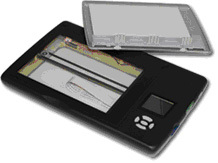 The Flip Pal Mobile Scanner and accessories are available for purchase from FxGS. If you would like to reserve a scanner or other items, send an e-mail to Lee James Irwin familymatters2u@gmail.com. You can pay by cash or check, and arrange for pickup at a mutually agreeable time. If you want to pick one up now, call Lee James and arrange a time for pick-up and payment at his home in Falls Church. Please call him at (703) 573-2985. * Includes Family Tree Heritage; Photo Plus; Page Plus; Scrapbook Artist, Web Plus; Slide Show Expressions. For PC/Windows only. 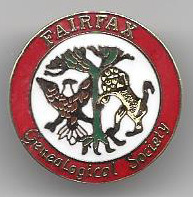 In the mid-1980's, the Fairfax Genealogical Society undertook a project to transcribe the gravestones found in cemeteries throughout Fairfax County. This effort resulted in the publication of a 6 volume set of books in the 1990s. The project also resulted in the discovery of more than 350 burial sites in the County. Click here to see a more extensive description of the Gravestone Books and to find out which cemeteries are included in each volume. 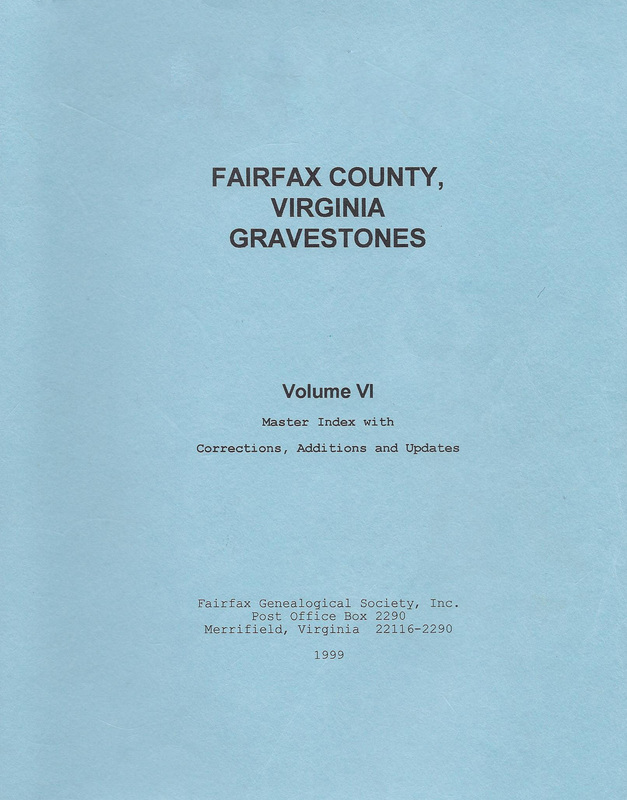 The 6 Volumes of the Fairfax County, Virginia Gravestones books cover the areas listed below. They may be ordered from Heritage Books at http://www.heritagebooks.com, telephone 1-800-876-6103.